How much do I love these candles created by Crescent Hill Designs? Such personality! And such a very clever idea. Click on the photo for more of the artist’s work. 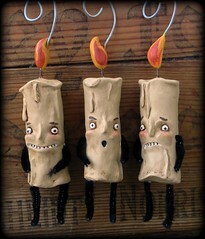 Those are by far the cutest Halloween ornaments that I have seen for a long time! Thanks for sharing your cool find Julie!